Reflections and Ruminations: Seeking God’s closeness is as easy and as difficult as loving our neighbour. Seeking God’s closeness is as easy and as difficult as loving our neighbour. When Jesus was asked which of God’s many commandments in the Jewish laws was the most important, it opened up for him the opportunity to articulate that in all their observances and rituals, it was imperative that we not only love God, but that we do so by loving our neighbour. All those 613 laws in the Talmud were fulfilled if one was sincere and ardent about these two things – loving God and loving one’s fellowman. The repercussions of this revelation are truly astounding and ground shifting, if we are serious in living them out. What we often fail to understand in this teaching is that by loving neighbour, which is every man, woman and child, one is bringing God who often seems to be so far away, to be very real and very present into our world. Yes, the Christmas event was the incarnation of God made man, but it remains only an event isolated about 2000 years ago if we do not act willingly to carry out the second most important commandment to love one another. 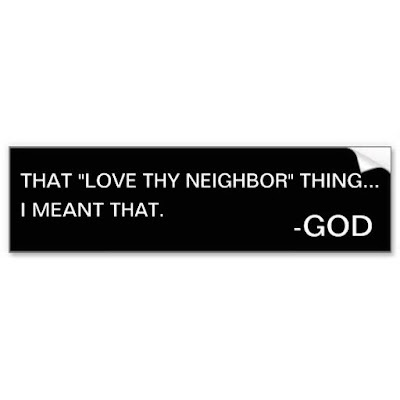 It would have been so much easier if Jesus just left it at the first commandment of loving God, wouldn't it. Most of us who try to practice our faith with some degree of regularity do this. Some may just be going through the motions of dragging themselves to Church each Sunday and with motivations that are as varied as there are tastes in clothes and food. If just being present at liturgical services was the minimum requirement, it might not be much of a challenge to be called a Christian. But contained in the second commandment of Jesus to love our neighbour as we love our selves is always going to be the harder and more troublesome part of religion, and part of the reason is because the neighbour or the other person to whom we need to love is often going to be asking of us something that isn’t quite convenient, isn’t very comfortable, but also sacrificial in some way. To stress this point, Jesus told the parable of the Good Samaritan. All of us, to a man, will find ourselves having much more in common with the priest and the Levite in that story than the Samaritan, but all of us who have a sound conscience will also realise that we would like to somehow become more like the Samaritan. In his teaching of this parable and in his exhortation to all of us that our love for God has to include the love of neighbour, Jesus is making sure that our prayer and worship life must never just stay at the celestial level, where we have lofty ideals about mystical union with the God of creation. That love with the Divine Lover has to come to brass tacks. This phrase “brass tacks” has an interesting etymology. It refers to the studs or tacks that are hammered into furniture in order to hold down the leather to the frame, making sure that the leather doesn’t shift from their purpose and position. Our active and often sacrificial love for those outside of our personal universe (a.k.a. our huge egos) ensures that our love of God too, doesn’t shift from its purpose and intent – to make God real and present to the world. Just acting on and respond to a certain moral ‘voice’ within our hearts alone may get the job done, but it may result in a mere humanism. Doing it in response to our faith in God does something more – it gives us a means of ‘checks and balance’ because we have a standard to measure our love by – the measure of Christ’s love, which is the gold standard. The end of Matthew’s gospel has a truth that is startling if we do not take Jesus’ instructions seriously, especially those of us who are his baptised brothers and sisters. There is a judgment at the end of our lives that awaits us, and this judgment, as Jesus teaches, is not so much based on whether we believe in God’s existence or not, but whether we have loved one another, even in those whom we could not perceive Christ’s presence. Those who were placed on the King’s left hand and were banished to the eternal fire prepared for the devil and his angels were those who neglected to love those in need. The temptation to just love others without our regular response to communal rite and ritual will always be there, in the same way that the temptation to only love those who are our 'kind', and make life good for us. That is because our self-centered and sin-disposed human nature does not automatically lend itself to activities that require discipline and effort easily. The small numbers that are regular visitors to the gym to keep themselves fit, compared to the huge numbers of the human race will easily attest to this truth, and this is for something that benefits our physical bodies which is tangible. What more for the Eucharist and church services, which many may say is ethereal and even unearthly? In truth, it is in our regular coming together at communal prayer and worship, where we stand shoulder to shoulder with our brothers and sisters in the faith that we are reminded of the need and the reality of Christ in the unchurched around us outside. We need our communion in this way to lead to mission. When we do this, God who is love, becomes real.